Choosing A TV, Is Bigger Really Better? 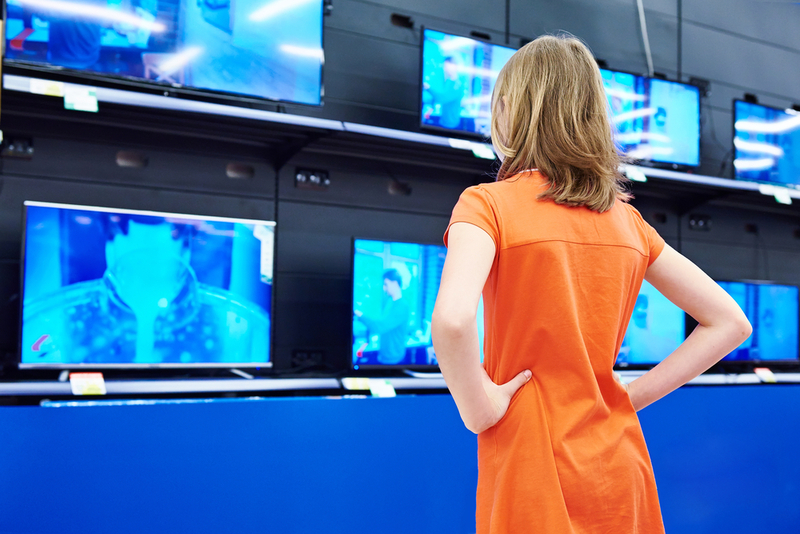 Home > Blog > News > Choosing A TV, Is Bigger Really Better? Screen sizes are measured diagonally. That means, the length from one corner of the TV to the diagonally opposite corner is the basis of measurement which we find on the market. As the unit of measurement, inches are used universally for easier understanding. There are several resolutions available on the market for TVs. The better the resolution, the better the image quality. Which means, higher resolutions will allow you to see sharp images even when you move closer to the TV. This means you can sit closer to a 4K TV and still see sharp images, but the same distance will give less sharpness for a 1080p resolution TV. The resolutions are available in HD (720p), FHD (1080p), UHD (4K) and OLED (organic light-emitting diode). The most defining factor when choosing a proper TV size is the viewing distance from the TV screen to the viewer’s eye, and the size of the room. Wall mounted TVs will allow more viewing distance, while standing TVs on a furniture will reduce it. That’s because having the TV on a furniture puts it closer to the viewer, hence shortening the viewing distance. There are many formulas out there by many TV experts. Some say the ideal distance is 1.5 – 2.5 times of the screen size, and some say that the viewing distance (in feet) should be multiplied by 7.7 to find the proper screen size. For example – if you have a viewing distance of 4.2 feet in your room, your proper screen size will be 4.2 x 7.7 = 32.34 or 32 inches when rounded. Some sources say the best field of view (FOV) can be achieved by dividing the screen size by 0.84 For example, if your screen size is 32 inches, than your best field of view will be 32/0.84 = 38 inches or 3 feet 2 inches. However, for 4K resolution TVs, the benchmark is slightly different. The screen size is multiplied with 1 or 1.5 to find the ideal viewing distance. That’s closer than the usual distance, because 4K has a higher resolution, resulting in fine viewing experience from up close compared to other resolution TVs. Depending on your room and its furniture arrangement, you can adjust the TV distance and position for finding your own comfort. Too big of a TV screen or too short of a viewing distance will put strain on your eyes and also disrupt your viewing experience, because you would have to move your head. Keeping these in mind, you can set your TV to the distance and position which suits you best. Previous PostExpand Your Mind with TVNext PostHow Does an Antenna Work?